Looking for a quick and easy way to make pizza at home? 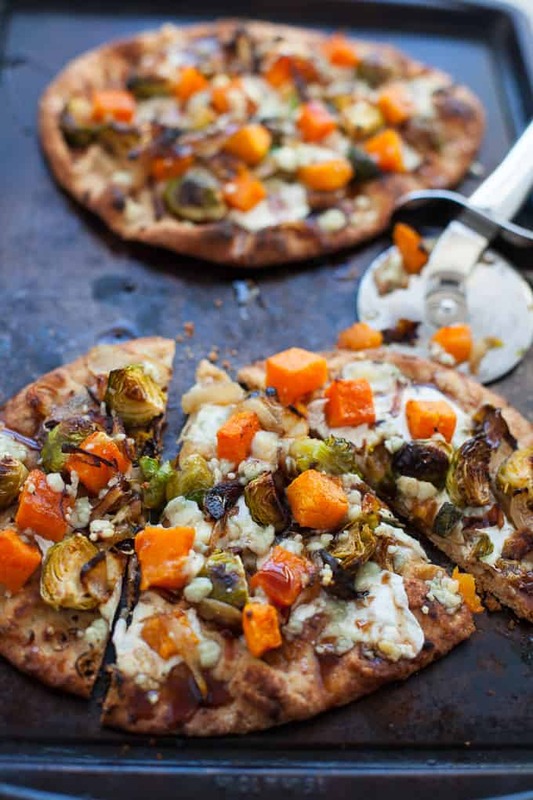 Try my butternut squash and Brussels sprouts naan pizza! 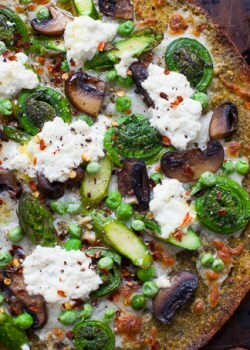 Perfect for a veggie lovers pizza night. Naan pizza is basically the next best thing to sliced bread. Naan bread is delicious but not just at your local Indian restaurant. It’s amazing as a convenient go-to, no-fuss pizza crust. No pre-bake, no kneading, no pulverizing a cauliflower. Just straight up bread that you can use as pizza crust. Pretty genius if you ask me. 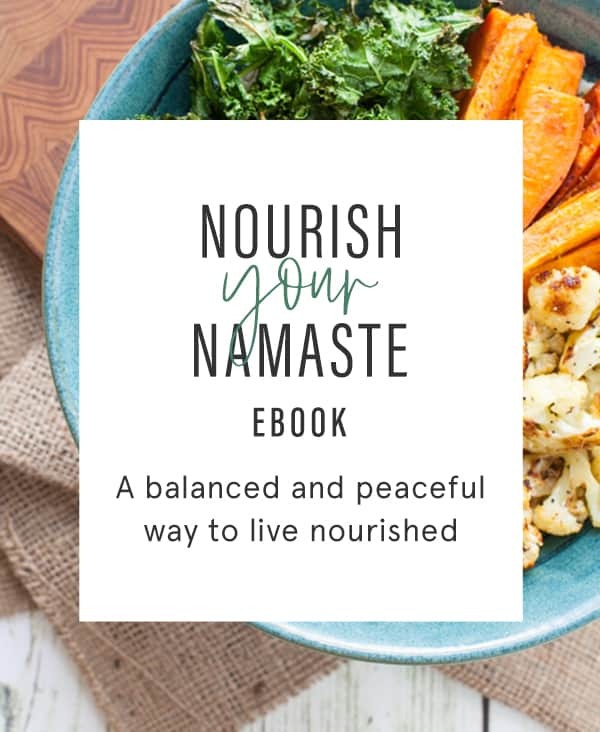 I discovered naan pizzas last year with my grilled hemp pesto peach flatbread pizza but have been searching for the perfect comeback recipe for naan bread pizzas and I think I found it. 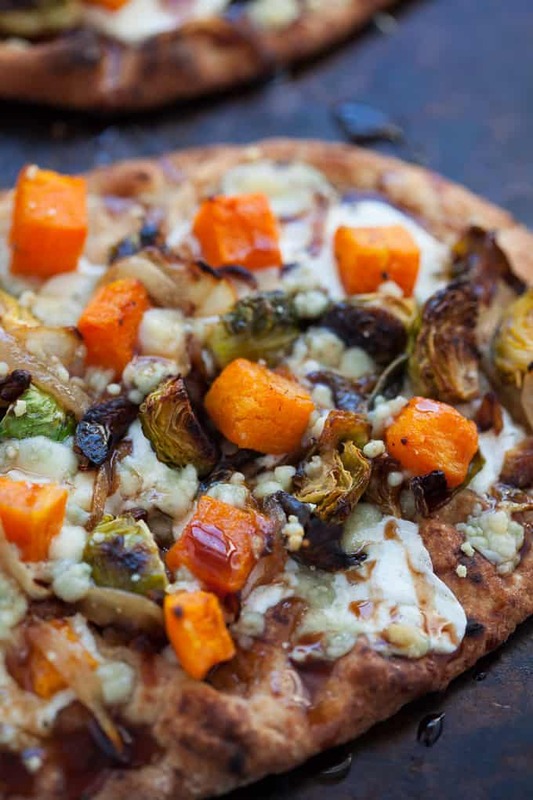 Butternut squash and Brussels sprout pizza. 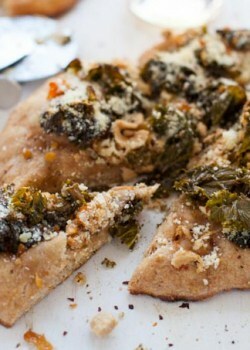 Which could also be renamed Kara’s Two Favorite Winter Vegetables Naan Pizza. I love Brussels and butternut squash this time of year. I just roast ’em and then put them on whatever during the week: salads, pizzas, side dishes, toast, eggs, you name it. But this pizza is so much more than B squared. It’s ALSO got caramelized onions, gorgonzola, mozz AND a balsamic reduction. I served one of these babies up with a side arugula salad with lemon, EVOO, S& P, for dinner this week and it was perfection. Also, 2018 has been off to a WEIRD start for me. And I’ve heard this from some other friends too. Is there some weird 2018 juju in the air? 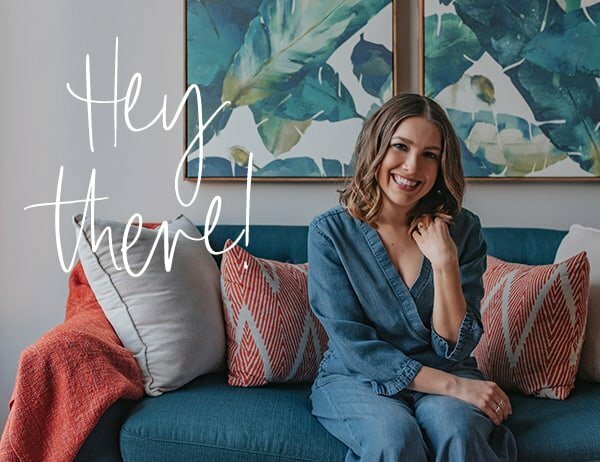 2018 started out with me having a cold, finding out that my landlord might be breaking my lease for my new office space as she’s dealing with a personal emergency, oh and the heat wasn’t working at my coworking space today so I had to shuffle my clients to another location. Just WEIRD stuff. Not to mention a new health issue to try and manage. Trying not to stress out about things as it’s only the second weekend of the year but MAN, 2018 is not smooth sailing right now. But as I tell my clients, this too shall pass. I know this phase isn’t permanent and will eventually pass. Anyone else feeling like 2018 is off to a shaky start? 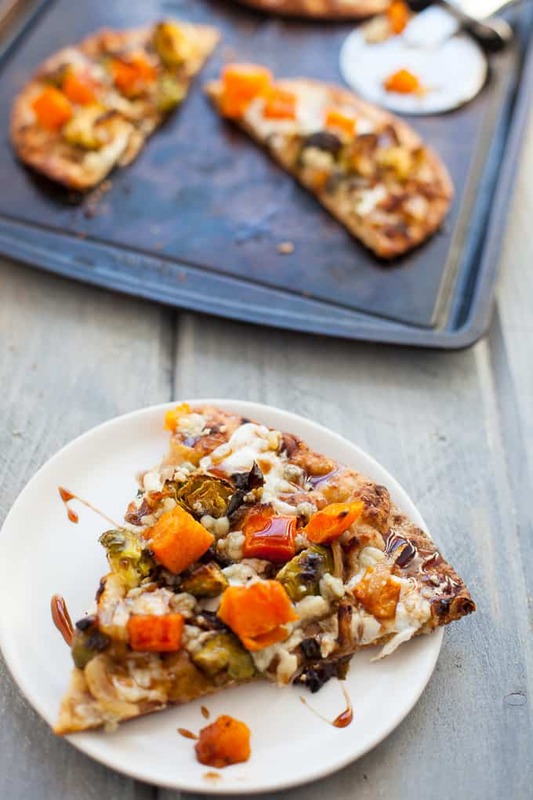 Enjoy this pizza for a quick weeknight dinner or Friday pizza night! Roast the veggies and caramelize the onions ahead of time to save some time and energy during the week. Add butter to large saute pan over medium-high heat. Add a handful or two of sliced onion at a time, stirring until translucent, adding another handful or two at a time, until all onion is used up. Turn down heat to medium-low, stirring occasionally, for 45 minutes, or until onions are mostly browned and caramelized. Add butternut squash and Brussels sprouts to parchment-lined baking sheet. Toss with 1 tablespoon olive oil and season with salt and pepper. Bake for 20-25 minutes, or until tender. Brush naan bread with remaining olive oil and season with salt and pepper. Evenly divide mozzarella cheese, butternut squash, Brussels sprouts, gorgonzola cheese and caramelized onions between the four pizzas. Bake on pizza stone or baking sheet for 7-10 minutes, or until cheese is bubbling and bread is crispy. Optional: Drizzle with balsamic reduction. 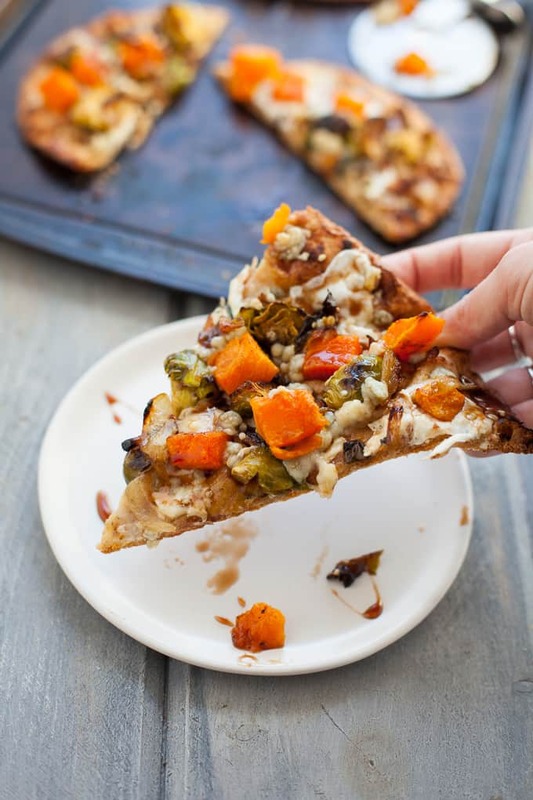 For more pizza night inspiration, check out these recipes below! 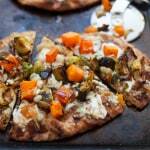 I love using naan for pizza crust and all those caramelized veggies look amazing! I adore naan pizza! And loving that balsamic drizzle!!! 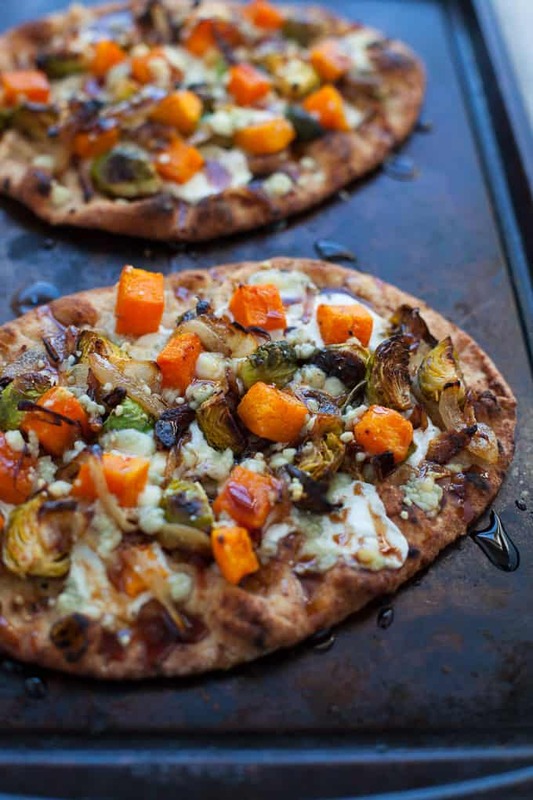 brussels and butternut squash together are everythinnng! 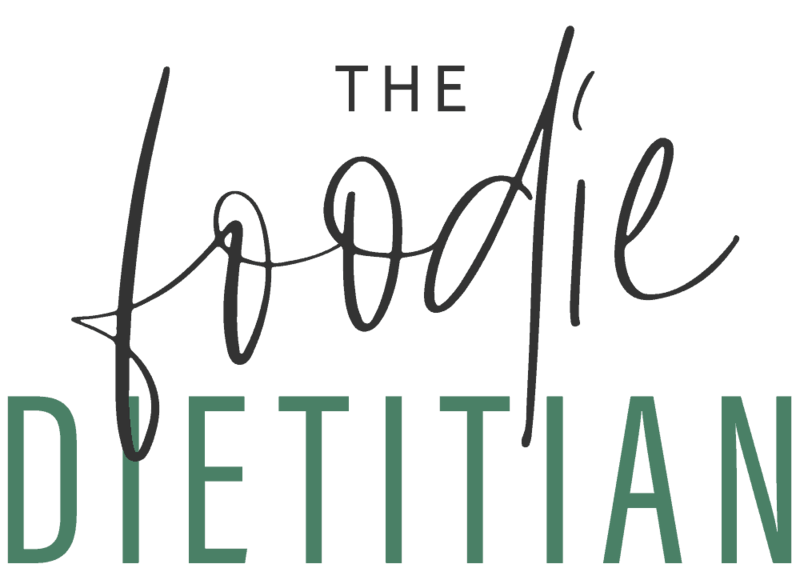 This recipe looks delish I’m definitely going to try it, but maybe without the gorgonzola…I don’t like the flavor of it but I do love mozzarella! Thanks, Nicole! You could try goat cheese too! Looks so wonderful! No combo for me to try! Now THAT’s a pizza! Love these seasonal flavors. How creative Kara! I absolutely love using whole wheat naan as a base for pizza. And Butternut squash and brussels sprouts are such a delicious combo. 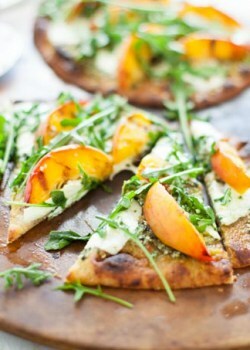 This looks so delish Kara! Oo this looks so yummy!! This looks so delicious Kara! Great combo and love the simplicity of using Naan! Two of my favorites on delicious naan bread! Looks perfect for a winter meal! Oops ! I didn’t realize it was caramelizing; I was thinking translucent. Sorry …..